The statue illustrates Lincoln’s role as the Great Emancipator and, in this way, impresses upon all visitors that Lincoln should be remembered first and foremost as the man who granted liberty to the American enslaved. The larger than life bronze figure immortalizes and aggrandizes Lincoln’s role in eradicating slavery, and also celebrates and memorializes his political success and moral fortitude. The selectivity of the statue forgets that Lincoln’s career was plagued by intense political tension and the bloodiest war in American history. It also ignores the strategic motives behind the proclamation, and instead represents Lincoln as a noble and compassionate leader responsible for the preservation of the American ideals of brotherhood and equality. As a whole, the white granite monument exudes power and relates unmistakeable importance, by dominating the green surroundings with its size and structure. Complete with an impressive 117 foot obelisk, the tomb towers over the gently rolling hills and draws all eyes to its magisterial presence, much like the Washington monument in DC. In this way it is clear not only that Lincoln should be the focus of one’s gaze and thoughts, but also that Lincoln’s gaze is all-powerful and reaches out beyond his tomb and across the American landscape of time and space. The resemblance to the Washington monument also serves to establish a connection between the “Father” and the “Savior” of the American nation. At the top of the south stairs is the heroic bronze statue highlighted above. In front of the tomb entrance is a bronze bust of Lincoln designed by Mount Rushmore architect Gutzon Borglum. Inside the tomb are memorials that serve to complement the partial memory of Lincoln portrayed on the exterior of the monument. These statues of Lincoln depict various aspects of the President’s life. Notable among them is a miniature replica of the President as portrayed in the Lincoln Memorial. There are also plaques with excerpts from his most famous speeches. The burial chamber contains a large red granite cenotaph that marks where Lincoln’s body is buried below ground in a steel and concrete reinforced vault. Curiously enough, Lincoln was not initially buried below ground but was moved as part of reconstructions in 1901 after an attempted grave robbery in 1876. The tomb was designated as a National Historic Landmark in 1960 and was placed on the National Register of Historic Places in 1966. The designation of this site as one that possesses “exceptional value… in illustrating or interpreting the heritage of the United States” “worthy of preservation” demonstrates processual memory. [7,8] The site designation is an embodiment of the literal and symbolic incorporation of Lincoln into the official narrative of US history. Though during his lifetime Lincoln was disliked by many of his contemporaries, he is now championed universally as one of the greatest U.S. presidents whose life and work relate fundamental American values essential to the continued preservation of the nation. It is interesting to note that the years in which this site was recognized by the National Parks Service (a government bureau) coincide with the height of the Civil Rights Movement. This connection brings to mind the process of reinterpreting memorials so that they better reflect current values and acquire contemporary resonance. In this context, designating this site as a national treasure was a symbolic means of recognizing and celebrating the first steps in the fight for racial equality in America. It was an act that invoked the memory of Lincoln as the Great Emancipator, further contributing to the partiality inherent to the memorial. The following video is a brief but comprehensive tour of Lincoln’s tomb that details the history and aesthetic and symbolic aspects of this site of memory. 1. 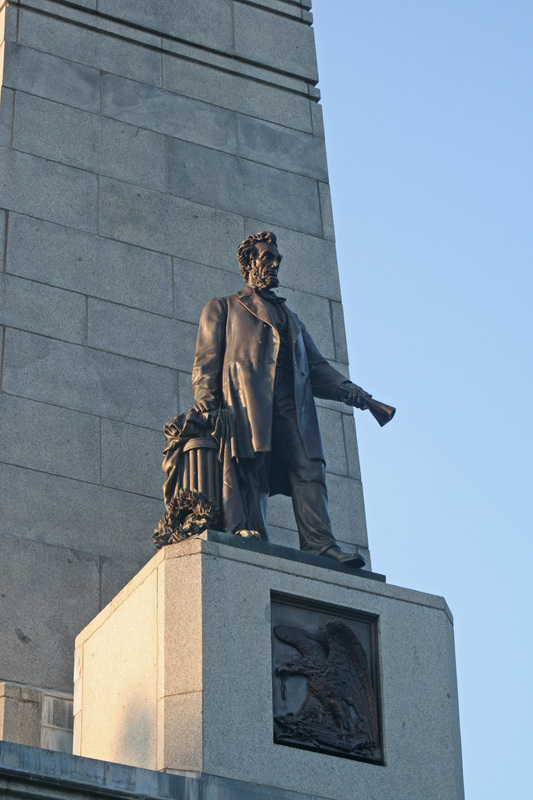 “Lincoln Tomb State Historic Site.” Abraham Lincoln Online. Abraham Lincoln Online, 2015. Web. 28 Mar. 2015. 2. “Abraham Lincoln and Springfield.” Abraham Lincoln’s Classroom. The Lincoln Institute, 2015. Web. 28 Mar. 2015. 3. 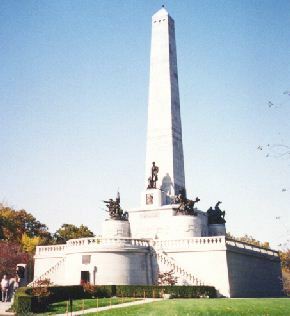 “The Lincoln Monument Association.” Lincoln Tomb. Lincoln Monument Association, n.d. Web. 28 Mar. 2015. 4. Holzer, Harold. Foreword. Summers with Lincoln: Looking for the Man in the Monuments. By James A. Percoco. New York: Fordham UP, 2008. Xi-Xvii. Google. Web. 28 Mar. 2015. 5. Gopnik, Adam. “Angels and Ages.” New Yorker 28 May 2007: n. pag. The New Yorker. The New Yorker. Web. 7 Apr. 2015. 6. Guelzo, Allen C. “Does Lincoln Still Belong to the Ages?” Journal of the Abraham Lincoln Association 33.1 (Winter 2012): 1-13. The Journal of the Abraham Lincoln Association. Michigan Publishing. Web. 7 Apr. 2015. 7. United States. National Park Service. “National Historic Landmarks Program.” National Parks Service. U.S. Department of the Interior, 08 Apr. 2015. Web. 12 Apr. 2015. 8. United States. National Park Service. “National Register of Historic Places.” National Parks Service. U.S. Department of the Interior, 08 Apr. 2015. Web. 12 Apr. 2015. Illinois Adventure #1703 “Lincoln’s Tomb”. WTVP. YouTube. N.p., 22 Aug. 2013. Web. 12 Apr. 2015. “Lincoln Tomb.” Illinois Historic Preservation Agency. State of Illinois, 2015. Web. 28 Mar. 2015. This entry was posted in Uncategorized on March 23, 2015 by Hilda Santiago. This post is extremely well organized and informative; you did a fantastic job! Your post is very well written as well, with a ton of interesting facts. For my project, I researched the humble beginnings of Lincoln and the Boyhood Memorial site that preserve the memories of his past in Indiana. I was drawn to this post because I wanted to see if his eternal resting spot was as well preserved and informative of his lifetime achievements as the Boyhood Memorial site. It is an interesting parallel between the two because the Boyhood site completely enshrines the past and does not focus very much on Lincoln’s achievements and presidency as much as his character and development. In contrast, the burial ground uses the place of his birthplaces as the place where his death is celebrated, but focuses on his achievements throughout his lifetime and possibly unconsciously gives hope for future generations to follow is such a great leader’s footsteps by making this site so prominent. Although I expected it to be extravagant, I was not expecting a memorial site to be as colossal and detailed. It would be an interesting parallel to compare a burial site of other great leaders around the world who have similarly extravagant memorial sites. How do descendents of other great leaders feel about their fore-bearers not getting memorialized so extravagantly? I may have missed it, but it would also have been neat to read about the inspiration for each of the pieces of the memorial was. Were objects like the obelisk erected because there was somehow a deeper connection of demonstrating that Lincoln was global minded or was it drawing a parallel with the Washington DC obelisk in the National mall? It is neat how the site also demonstrates how beloved he was as a President and person, as the funds were collected by donations from the public. He truly is an admired individual. Fantastic job!